Former Alaska governor and Republican vice presidential candidate Sarah Palin took to her Facebook page again Sunday night, this time to caution against "tactics that can be accused of leading to intimidation or harassment" in the health care debate. 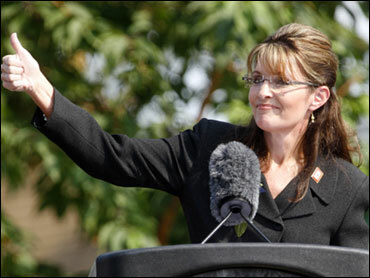 The message came just two days after Palin used the social networking site to accuse President Obama of planning to establish bureaucratic "death panels" through health reform. "Alaskans will join Senators Murkowski and Begich in town hall meetings to discuss the current health care legislation," Palin wrote in her latest post. "There are many disturbing details in the current bill that Washington is trying to rush through Congress, but we must stick to a discussion of the issues and not get sidetracked by tactics that can be accused of leading to intimidation or harassment. Such tactics diminish our nation's civil discourse which we need now more than ever because the fine print in this outrageous health care proposal must be understood clearly and not get lost in conscientious voters' passion to want to make elected officials hear what we are saying. Let's not give the proponents of nationalized health care any reason to criticize us." Palin's comment that there are "disturbing details" in the bill may have been a reference to her Friday Facebook message, in which she wrote that under the president's health care plan, the elderly and disabled "will have to stand in front of Obama's 'death panel' so his bureaucrats can decide, based on a subjective judgment of their 'level of productivity in society,' whether they are worthy of health care." This accusation is a myth that has been deemed wrong by fact checkers. With protests against health care reform efforts turning violent, Palin now seems to be trying to tamp down on some of the anger that the sorts of distortions she offered on Friday helped incite. During the same week in which Palin referred to Democrats' health care plan as "downright evil," one Democratic congressmen received a death threat from someone angry about health care reform. While former Republican House Speaker Newt Gingrich defended Palin's comments over the weekend, moderate conservative pundit David Brooks called her statements "crazy," the Washington Monthly's Steve Benen reports. Republican Rep. Jack Kingston of Georgia told Bill Maher on Friday that Palin's "death panel" statement is "a scare tactic. No question about it." The White House is taking multiple steps to combat what its deems misinformation. Most recently, it launched a "reality check" Web site to debunk myths. Melody Barnes, the president's Director of the Domestic Policy Council, specifically addresses the "euthanasia" or "death panel" myth, rebutting a video clip of Rep. Virginia Foxx (R-N.C.) claiming that people will be "put to death by their government." Meanwhile, as Palin and some other conservatives distort the facts in the health care reform debate, the elderly in Palin's own state must deal with flaws in the system. "State programs intended to help disabled and elderly Alaskans with daily life -- taking a bath, eating dinner, getting to the bathroom -- are so poorly managed, the state cannot assure the health and well-being of the people they are supposed to serve, a new federal review found," according to a July article from the Anchorage Daily News.